At the beginning of April, TEAM! lost a member when Jonathan Moore deferred his place to 2014. At such a late stage we thought it was going to be an impossibility to draft in a replacement, but we were wrong - within an hour of hearing the news, Emily's oldest and closest friend had contacted us to offer his services and so TEAM! was immediately back up to full complement! Given his late entry, we wanted to introduce him to you and he kindly agreed to a rare interview, transcribed below, which took place at the Marathon registration in London's ExCel this afternoon. TEAM! : Teddy, thank you very much for taking the time to talk with us this afternoon, could you tell us how you knew Emily? Teddy: I first met Emily when Alison and her mum adopted me from the island of St. Michael in 1982. I was drawn to her because at the time she was the same size that I was, but - as you can see in this picture - it was not to last. Even though she became much bigger, we were always inseparable and so when this opportunity to join TEAM! came up, I just had to grab it with both paws. TEAM! : You have been training now for 2 weeks, could you tell us about your hydration and nutrition? Teddy: Bears' food needs are different from yours, especially when it comes to endurance sports. Personally, I find that my best performances have come after I have gorged myself on chocolates and tea. In fact the better the chocolate the better the performance and if any one out there wants to witness a bear giving WIlson Kipsang a run for his money, please send a box of Knipschildt La Madeline au Truffe to me, c/o TEAM! - they are rocket fuel. TEAM! : Amazingly, you started training for the marathon with only 2 weeks to go, what has your average week looked like? Teddy: Mondays and Wednesdays are when I work on my endurance, on these days I sit for anything up to 9 hours at a stretch. On Tuesdays and Thursdays I practice sitting in a real pocket and Saturday and Sundays are rest days. Friday is the hardest day, that is when I work on jiggling up and down - I can now manage over 3 hours without bringing any chocolate back up, and I am hoping that by Sunday I may even manage 4 hours. 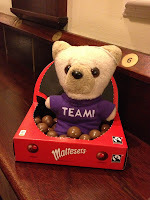 People on the Embankment had better watch out just in case - don't be fooled by my size; I eat a lot of chocolate. TEAM! : Mo Farah's and Paula Radcliffe's training takes them to the Rift Valley in Kenya, do you do any of your training at altitude? Teddy: Indeed, don't forget that on race day I will be competing at nearly 5ft above ground level and it is important for me to replicate these conditions in training. When I am not pounding the streets, I do this by completing my endurance sessions on a high shelf. TEAM! : If all the training goes to plan, how fast do you think you can run London 2013? Teddy: That all depends on the chocolate and tea situation. And Alison. But mostly the chocolate and tea. TEAM! : There's likely to be much media focus and scrutiny of your performance in this race. Does it make you want to prove the critics wrong or do you just ignore it? Teddy: Who are these critics? Give me their names and addresses. TEAM! : Er... Moving on, we'll ask a few quick questions about you so people can get to know the real Teddy! Property aside, what's the most expensive thing you've bought? Teddy: A 2009, gold leaf-covered special edition bar of Wispa Gold. TEAM! : What do you most dislike about your appearance? Teddy: Do you humans really think like that? TEAM! : Who would play you in the film of your life? Teddy: Bear Grylls, but he may not be tall enough. TEAM! : Who would you invite to your dream dinner party? Teddy: Yogi, Baloo, Winnie, Fozzie and Paddington. It would be a picnic - old habits die hard. We welcome this remarkable bear to TEAM! and wish him the very best of luck. 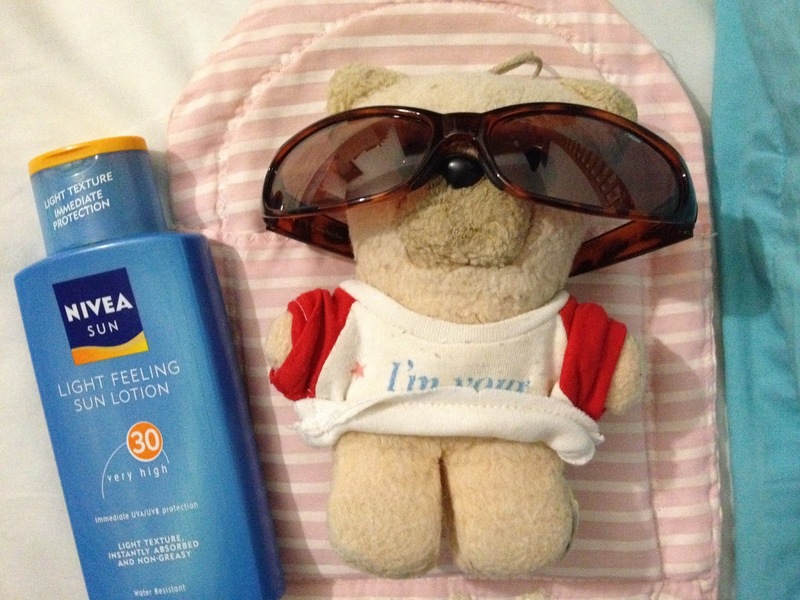 Ever committed to his training, Teddy went off to complete yet another endurance session in the first of this year's sun.